I've been listening a lot to the work of Horatiu Radulescu lately, and though he isn't my favourite composer, he does fulfill all my wants as a fan of contemporary repertoire. On the one hand, his work is absolutely chock-full of eggheaded theory, but on the other hand it's all rooted in a coherent soundworld based on concrete facts of acoustics. To boot, he presents his own mystical philosophy influenced by these spectral explorations, though much easier to swallow than Stockhausen's (but more exhuberant than Per Norgard's). It's the holiday season, so I'd especially recommend his Piano Concerto. I've reviewed the CPO recording today on Amazon. But the Avant-Garde Project's torrent of earlier (and much more uncompromising) works for flute also make a great introduction. In South Africa we have really big cats! I think you are correct about suggesting his other works as an introduction to the majority of Radulescu's music. If someone starts with the Piano Concerto they will not hear the kind of sound world that is found in most of his other works. 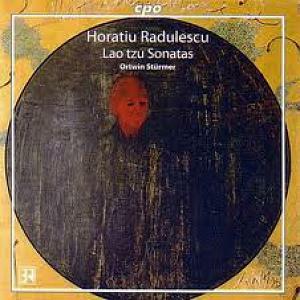 I count his piano sonatas and quartets among my favorite works by this very interesting Hungarian composer. I'm curious if you've heard the SQ No.4 Infinite to be cannot be Infinite Op.33 (w.tape), which seeks to imitate a 128 string viol de gamba? Arditti on RZeditions. Also, Arditti's violist Garth Knox plays Das Andere on an all spectral cd. And there is a SQ No.2, Practicing Eternity, unrecorded. The Knox CD includes pieces for sound icon, too, which are pretty nice, but nothing so good as that LP with Clepsydra and Astray. That's not easy to find, but fortunately the Avant Garde Project (#111) has that available. That wasn't my first (Inner Time II for seven clarinets was), but it was the first to really grab me. If someone starts with the Piano Concerto they will not hear the kind of sound world that is found in most of his other works. Four works by Radulescu, two for tuned viola, one for two violas, and one for viola and two pianos played as 'sound icons' (which gives the really cool impression of sympathetic strings) add up to one of the most hypnotic hours ever! Das Andere is for all intents Radulescu's 'Hit', and is an 18min. spectral workout on viola that is quite simply all consuming. The same goes for the much shorter Lux animae II. There is certainly 'Truth' here, that's for sure... as a description I'll just say that I'm sure you'll find it as cool as you expect. I think this what it's all about. This goes for Intimate Rituals in spades. With the inclusion of the two pianos, the overall effect is of a cosmic/universal raga... I suppose it's the alap that is the introduction, without the tabla? The piano string make the best drones here. The sore thumb is Agnus Dei for two violas. Here the agenda is much different, with normally played notes, that sounds to me like a combination of late melodic Stockhausen and Goeyvaarts,... much more Dutch, haha. There is also, I think, a touch of Part here, as there is in so much these days (not a bad thing). Either way, you may find it 'beautiful', but it's totally different than the strictly spectral works. This work bases its spectralism on the notes. I liked it once the shock wore off. Basically, this is THE Radulescu disc. I haven't yet warmed to the massive SQ for the Ardittis, and this disc, as the title implies, gives us HR's vision in a perfectly small, yet equally massive, setting. Frankly, it's quite the meditational music. Hungarian??? I beg your pardon? :O He's Romanian every bit as I am! It's a Romanian name all the way. I have some of his works, such as his Piano Concerto, but I have not listened to it extensively yet. I followed your rec for Intimate Rituals (the Sub Rosa recording), but I haven't received it yet. I'm flattered! Cool! I'm sure you'll be intrigued. I think one of the pieces is 'live' on YT. Blew my mind. I'm also pretty thrilled with String Quartets 4 & 5. Five is on utube. Along with a fairly large collection of Radulescu on record (much of which, however, is hard to find "legitimately" these days), this blog has also linked to the only recordings of Radulescu's Third and Sixth String Quartets I've yet come across. They're both interesting works, in different ways; I encourage any interested parties to have a listen. I'm still hawking that viola disc. Did you get it? To anyone new to Radulescu, I think this might be the best introduction. The playing is out of this world, and the sonic impact is simply breathtaking. This is great, thanks. I think I have everything by Radulescu that's ever appeared on a commercial CD, but these works are entirely new to me. Today is Horațiu Rădulescus birthday. Wiki says he would have been 66.